"The Saga of the Skydiving Beavers" sounds like the title for a quirky children's book, but it's also a fitting epitaph for a strange, true story of an unconventional approach to habitat resettlement. In 1948, Idaho's Fish and Game service decided the best way to keep beavers away from growing urban centers was to strap them into old surplus World War II parachutes and airdrop them in the backcountry. The weirdest part of this story? It worked. It worked so well the man who came up with the scheme released a study called "Transplanting Beavers by Air and Parachute" detailing the process. Elmer W. Heter explained that beavers needed to be moved because they were a nuisance in settled areas but an asset to wilderness habitats. The issue was that it was hard to transport them to the appropriate places in Idaho because the backcountry was remote and hard to reach. At first, they tried to use mules and horses to carry the beavers into the wilderness, but the pack animals were "spooky and quarrelsome" when they had to carry angry, live beavers. Fair enough. 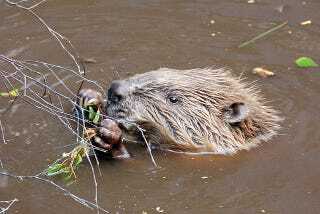 The beavers hated it too, often refusing to eat or becoming "dangerously belligerent." The report doesn't say exactly how many beavers died using this method, but it got bad enough that tossing them out of an airplane looked like a more humane scenario, so I'm guessing it wasn't great. When the 76 beavers were resettled via parachute, only one died, and that was because it "inexplicably" jumped or fell after wiggling out of the box. The "throw animals out of a plane" method has also been used in Guam, where mice were parachuted into the forest to kill brown tree snakes. Of course, in that scenario, the mice were already dead and filled with poison. The transport of live animals via tossing them out of an airplane remains a rare and novel approach to habitat resettlement. Satisfactory experiments with dummy weights having been completed, one old male beaver, whom we fondly named "Geronimo,'" was dropped again and again on the flying field. Each time he scrambled out of the box, someone was on hand to pick him up. Poor fellow! He finally became resigned, and as soon as we approached him, would crawl back into his box ready to go aloft again. You may be sure that "Geronimo" had a priority reservation on the first ship into the hinterland, and that three young females went with him. Even there he stayed in the box for a long time after his harem was busy inspecting the new surroundings. However, his colony was later reported as very well established.